Mustang Waters has a full range of accommodations which, depending on your needs, can be used individually or interchangeably. The ranch can accommodate up to 58 total guests in the ten new bedrooms in the lodge, three bedrooms in the main house, four bedrooms in the Bear Trap, two bedrooms in the Hunting Cottage, one bedroom in the Pool Cottage, and many acres of space for elegant glamping. Our brand new Lost Oak Lodge – a 4,000-square-foot state-of-the-art event facility, wrapped by a remarkable deck that by itself covers one-third of an acre and overlooks one of three fishing ponds. We are a perfect venue for weddings and family gatherings and corporate retreats and team building. The great room can accommodate up to 350 seated guests, and has a large preparation kitchen, a bar, and smaller meeting rooms. The commercial kitchen will set the tone for your perfect dinner, buffet or lunch meetings, and the “Texas” size bar is a great spot to start and finish your day. Ten luxury bedrooms (some king, some with two queen beds), each with its own decor, can accommodate 20-28 guests in beautiful accommodations and sunsets. 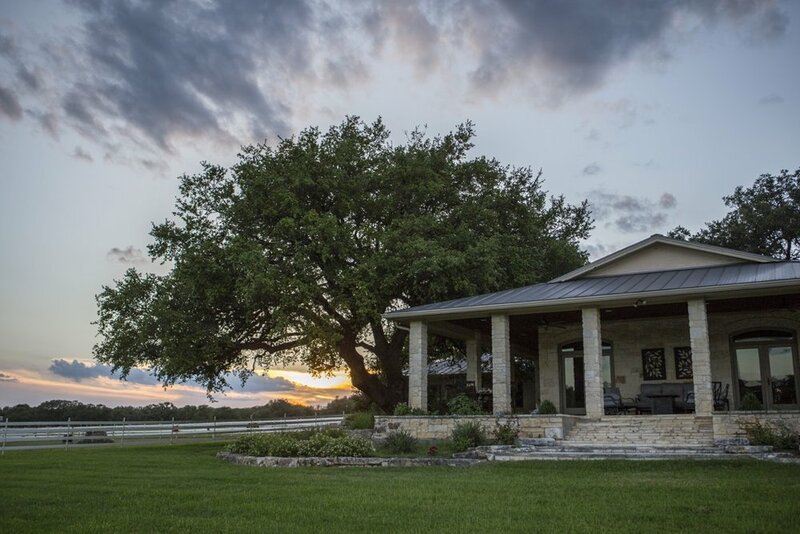 Guests can also stay at the 5400-square-foot Main House, which features more of the luxurious, Texas-style experience. With its open-floor plan, it is perfect for gatherings of business associates, friends and family. There is a stellar gourmet kitchen —perfect for entertaining—with Viking appliances, a center island with plenty of barstools, a breakfast nook, and a formal dining room. The Hunting Cabin is a two bedroom guest house with a living room, a flat screen TV, a fully-stocked kitchen, patio area and two bathrooms. There is also a Pool Cottage with a queen size bed and sitting area. Bathrooms for this cottage are outside.